Episodic Nugget is a space where I recap and comment on specific fragment (whether a chapter of a manga, an episode of an anime, or even a particular story arc) of a series that I love and/or found especially noteworthy. Spoiler abound regarding everything happened in said fragment, obviously. 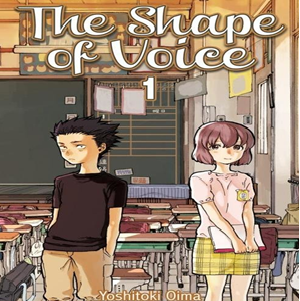 This edition features the first volume of Yoshitoki Ooima’s Koe no Katachi (licensed as The Shape of Voice in my country and A Silent Voice in North America), a shounen bildungsroman that started life as an award-winning one-shot. Just a couple of months younger than me (*cue existential angst*), Yoshitoki Ooima made some waves with Koe no Katachi a few years ago, even earning the moniker ‘tensai’ (=genius) in the process. It’s entirely warranted; while coming of age story is dime a dozen these days, rarely do they come with such combination of refined storytelling, expressive art, and unflinching sense of brutal honesty as Ooima’s, which is even more impressive considering her relatively young age. Having That one-shot, about the prickly (to say the least) relationship between a sixth-grader and the new hearing-impaired girl in his class, earned her a serialization and developed into the most striking opening volume of a manga I’ve read in recent times. Having started with a brief in medias res scene, we spent a vast majority of Volume 1 on the faithful childhood year when the main protagonist Shouya Ishida first met Shouko Nishimiya. Before that though, a groundwork is built by diving deep into Shouya’s headspace, showing glimpses of his life through a stream of consciousness narrative that felt remarkably organic and free-flowing. We all knew a Shouya before—heck, I might’ve known a dozen Shouya: a head honcho, a class clown, and basically a regular sixth-grader with too much energy and time on his hands. The dynamics between Shouya and people around him provided just enough information on what he’s about, while also leaving plenty of things to be read between the lines. There’s the household with a hairdressing mom, an older sister who cycled through boyfriends like a baby switching diapers, and a conspicuously absent father figure. Then there’s his circle of friends, of whom Shouya spent all his leisure time with; jumping into river, playing games in a packed room that looks like it’s just hit by a hurricane, devouring cookies from mom, and generally just fooling around. A relatable, simpler time with the kind of people you thought would be your bros for life. But even in these happy times, there’s already a hint of wistfulness. Shouya’s two best pals wandered aloud if they should cut down on all these childish nonsense and start to think about the future, and while “crises” like this can be momentarily averted by magical moments such as the discovery of a cute animal, Shouya had visibly gotten restless and yearned for a new, more exhilarating, form of entertainment that could prolong his fantastic childhood joy indefinitely. A diligent and good-natured kid, Shouko has the misfortune (on top of the obvious one) to be transferred to yet another school and class ill-equipped to deal with someone like her. Further, she’s seated in front of Shouya, a bully in training who’s more than eager to treat her like a shiny new toy. What unfolded is a powerful sequence where Ooima delivered a cutting insight on the dynamics between a bully, his co-perpetrators, and his victim, as well as the very real obstacles faced by a disabled student trying to study and mingle in a public school. Here, it’s not like all kids were sociopathic bullies from the start toward Shouko, but they (including, appallingly, the homeroom teacher) eventually tire out of having to frequently accommodate her, while a teacher who wanted to organize an after-class sign language lesson is scathingly mocked and a student who had wanted to help ended up backing away after being called an arse-licker. It’s a depressing, painfully believable, look at a systemic ostracization and bullying, one that might be spurred by a single boy’s impulsive behavior, but also borne from a collective lack of awareness, patience, and empathy. While Shouya’s behavior is indeed deplorable, it’s important to note that he’s also a product of a flawed educational system, one that might be well-taught in logical reasoning (“she shouldn’t study here, because she slowed and dragged the entire class down with her!” ) but woefully lacking in emotional intelligence and maturity. 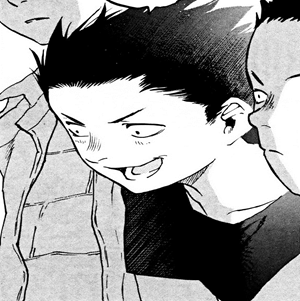 When Shouya eventually crossed the line and broke Shouko’s expensive hearing aid, he became the easy scapegoat as the entire class turned on him; yet another dead-on commentary on how the fragile and vicious nature of social dynamics in school, as even Shouya’s two best pals turned into his chief tormentors. Still, it’s hard to sympathize with him as he tasted what it’s like to be bulied for once, especially since he channeled his rage into Shouko, who’d been saintly and even extraordinarily nice to him throughout all this nonsense. It wasn’t after Shouko transferred away, having finally snapped and fought back, when Shouya realized that, maybe, he’d been a pathetic garbage. There’s still some space left in this volume before we eventually circled back into the opening scene, when present day Shouya confronted Shouko (both high-schoolers now), having seek her out for an attempt at atonement. In-between, Shouya transformed from a carefree outgoing boy into a gloomy pariah, stuck with the reputation of being “the jerk who tortured and chased a deaf girl out of school” since then. It’s not the easiest thing in the world to portray a reformed bully in believable and sympathetic manner, but Ooima did a great job showing how the entire experience had wisened Shouya up, while also taking some pain to highlight the bitterness and self-resentment built up inside him within this period. 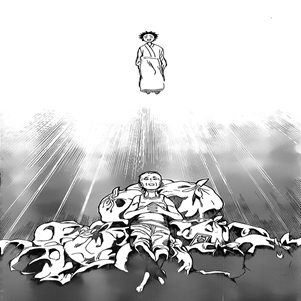 A particularly memorable sequence showcased Ooima’s penchant for dry humor as Shouya imagined his future self (with an amusing blank smile on his face) going through the motions in life, culminating in a full-page surreal scene depicted below. The volume’s certainly not short of hard-hitting moments; the anguish of Shouya’s good-natured mom as she berated him for his behavior, Shouya discovering Shouko’s notebook with tons of “thank you” and “I’m sorry” on it, and Shouko’s stonefaced mom (who seem to absorbed all the fury and bitterness in place of her daughter) expressing her preference for Shouko to have a more boyish haircut so that she wouldn’t be “bullied as much”. 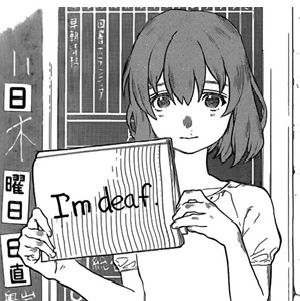 The thematic core of Voice primarily focus on Shouya, but this volume also indirectly raised the hard questions about educational circumstances for disabled kids. It’s something that I don’t think is going to be addressed further in future volumes (at the time of this writing, I’ve only read up to Volume 2), but I wish it would, along with Shouko’s own perspective and thought process in order to balance this a bit from being too much of a “privileged boy’s quest for self-redemption” type of story. It’s also why I’m not too excited on the likely prospect that this would develop into a romantic story, which would undermine the initial complexity that made this story stood out so much for me. Regardless of how the story continues though, the entire volume is stellar and ended with a cliffhanger that left one wanting for more (the beginning of Volume 2, as well as the ending of the original one-shot, revealed that Shouya had learned sign language). Yes, it’s an uncomfortable read, but just as the best of media wont to do, it’s also an eviscerating and important one.